The Red Rock Ridge and Valley Trail System is a network of existing and proposed trail systems purported and supported by the Freshwater Land Trust and other similar organizations. On Saturday, Jun 9, an event was held in Palmerdale, called Rock'n Turkey Creek, to raise money for the Turkey Creek Corridor of the trail systems, which boasts the Turkey Creek Nature Preserve, along with several existing and proposed trails. 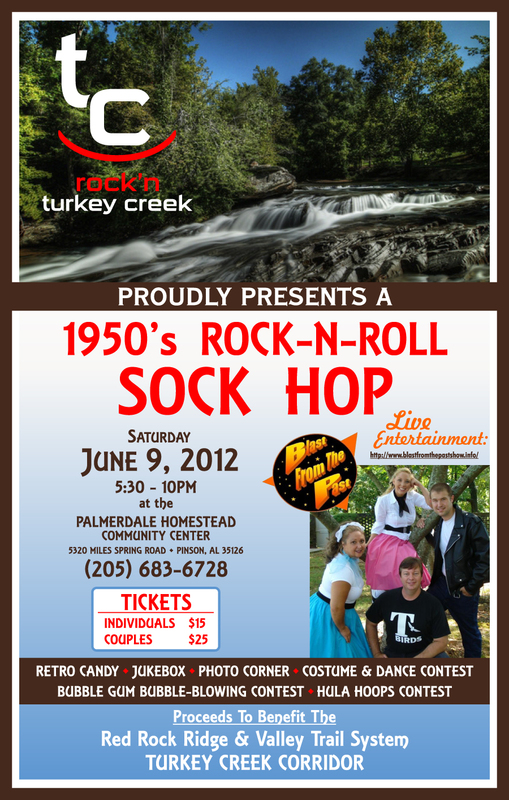 It was my great honor to have the hosts of this 1950s-styled event to use one of my photographs of Turkey Creek Falls on their promotional material for Rock'n Turkey Creek. A compilation of three bracketed photos, using HDR techniques, this long-exposure photograph was taken with the aid of welding glass used as a neutral density filter, to reduce the amount of light to reach the sensor. Along with other photographs of Turkey Creek, this photograph can be found in my galleries, here.